Attention maketers: While you are keeping one eye on the changes that Apple is bringing to your favorite advertising medium--Television, you should also be aware of the new emerging technologies that will change the game. 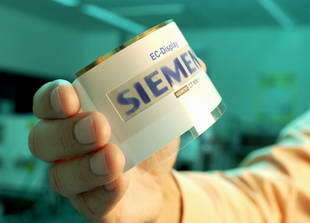 Siemens is working on flexible color display screens that will be printed on paper or foil. These displays can show a series of product photos, illustrations, instructions, etc. They are to be powered by printable batteries that are also a part of the packaging. Imagine an iPod box that features animated 360 degree views of the product or medical devices that feature step-by-step instructions for using the product right on the p-ackage. Scientists from Siemens Corporate Technology and Automation and Drives are currently optimizing materials that react so quickly that the displays can also show moving pictures. For all your eager Sony PSP toting thieves students returning to school this fall the Make Blog points to a DIY script for the PSP that will return the 100 possible combinations for a Masterlock combination lock when the code number on the lock is entered. One of the commenter wants this to run on a cellphone. You don't suppose the kids are looking to crack into their friends/enemies/targets lockers do ya? If you are a parent maybe you need to learn just what's possible with the technology your children have access to. 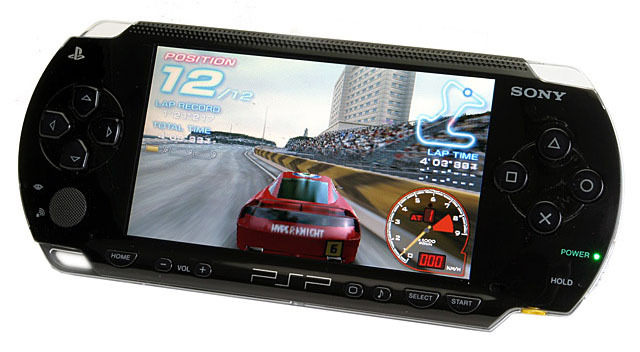 Most people have a handle on the child's internet access but what about the portable gaming system or cellphone. The recent news stories about downloadable scripts that unlock adult content in video games should be an eye opener that gets parents more interested in just what's possible with the technology their children have access to. Brace yourselves, people, Nate Berkus is back today on Oprah. What I find interesting here is the use of the uber personality brand Oprah Winfrey to mint new personality brands. We saw this, of course, with Dr. Phil and now with designer Nate Berkus. Berkus has captured a significant fan following that has been helped by the "slow drip" approach that Oprah has taken with him. Berkus appears periodically on Oprah's show and in her O Magazine but very little else has been seen of him. We don't have an over exposure story here. Today's appearance was classic Oprah/Berkus fare. The first story of a woman's living room makeover was a bit flat. The design was well done but nothing special. The story wasn't told in a compelling way. Rabid fans will disagree, believing that anything Berkus touches is gold. This room makeover is nothing that any number of other decorating shows offer every day. As far as emotional decorating makeovers, the game has been raised by ABC's Extreme Makeover Home Edition. They are casting the mold for captivating emotional storytelling around home design/decoration. Many other design shows are adding more emotion and storytelling to their shows in an attempt to keep up. Next we see a tour of Berkus' own apartment. Nothing special really. A bit stereotypically gay man's apartment aesthetic really. Masculine lines, neutral colors, travel mementos, etc. Personal details were included to fan the flames of fan fantasy that is most of the appeal of Berkus. The rest of the show featured the glue gun lady from O at Home magazine and decorating Q&A with Berkus. Nothing earth shattering. People just want to hear cliche' decorating advice coming out of his face and Oprah is happy to be the vehicle. Oprah has to do something bigger and more original with Berkus or the audience will eventually tire of these mini makeover stories. This show seemed flat. Has the Nate Berkus phenomenon run it's course? Has the TV Nate Berkus jumped the shark? Nate Berkus appeared on the Oprah show today to tell the story of his Tsunami ordeal. Something about the show was very bothersome. I think it was the fact that the show was so focused on Berkus and the emotional outpouring that he has received. Yes, he's a nice guy, yes, he has lost someone close to him, yes, it's remarkable that he survived but 150,000+ people did not survive. Oprah's global platform was not used to encourage or chronicle the outpouring of care, support and relief that this disaster has elicited. Yes she mentioned that her charity has donated $1 million to aid relief charities but it seems so much more could be done. Oprah did not even encourage people to give in some way. Berkus didn't mention any sort of relief efforts. This was all about Nate and the handful of survivors that were supporting actors in the Nate Berkus Story. Oprah was fanning the flames of emotional empathy for Berkus. Clearly so many people are emotionally attached to him already that an hour of tear inducing story telling and tributes will certainly expand his following. You can just feel the building of the Nate Berkus brand ready for launch sometime soon. He is, at the end of the day, just a regular person who has survived a horrible situation, lost someone close to him, and is now struggling to deal with his grief and nightmares. That makes him neither unique nor saint material. Many people in this country and world are going through similar or worse circumstances. He is a talented interior decorator who is being developed to be a celebrity. Perspective, people. Let's keep it in perspective. Nate Berkus will be appearing on the Oprah show on Monday, January 17 with an update on the Tsunami and the search for/loss of his partner. The story of Nate Berkus has brought this particular tragedy home to millions of Americans who have become fans through the development of his personality brand on the Oprah show. It will be interesting to see if Oprah swarms her fans in any unique way to support the relief efforts. She may just encourage donations to the Red Cross or other established aid agencies but wouldn't it be interesting if she has a creative way for her fans to make a difference? Update: Read my reaction to the show. Here.